I was asked once why businessmen in general are usually soul anti-government. I quickly responded by saying that it’s because they’re the ones that deal with the results of government. All of it negative. 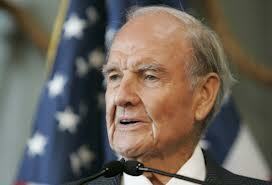 Just recently former presidential candidate George McGovern died. I noted with interest David posted a note on that topic. He quite rightly called McGovern a hero for his military service. My read was that David had some serious questions about the rest of his “service” , as do I.
McGovern was one who invariably thought government was the answer to any given issue. He never met a government program he didn’t like. He was a true dyed in the wool socialist, not unlike our current President. Like Obama, he believed in imposing high taxes so as to redistribute wealth from the rich in order to guarantee every American a minimum income… regardless of their working or not. Until, that is, such time as he relinquished his office and retirement and tried becoming a small businessman. He had a small fortune to invest because of his years in government, but he found it difficult to justify those actions of his while in government, whilst he wore the hat of the businessman. In 1988, I invested most of the earnings from this lecture circuit acquiring the leasehold on Connecticut’s Stratford Inn. Hotels, inns and restaurants have always held a special fascination for me. The Stratford Inn promised the realization of a longtime dream to own a combination hotel, restaurant and public conference facility — complete with an experienced manager and staff. Today we are much closer to a general acknowledgment that government must encourage business to expand and grow. Today we are much closer to a general acknowledgment that government must encourage business to expand and grow. Bill Clinton, Paul Tsongas, Bob Kerrey and others have, I believe, changed the debate of our party. We intuitively know that to create job opportunities we need entrepreneurs who will risk their capital against an expected payoff. Too often, however, public policy does not consider whether we are choking off those opportunities. . We intuitively know that to create job opportunities we need entrepreneurs who will risk their capital against an expected payoff. Too often, however, public policy does not consider whether we are choking off those opportunities. To the degree that McGovern is correct here, what he fails to recognize is that the only reason such changes in perspective occurred was because the Democrats through the Reagan/Bush years had a figurative gun to their head. They were forced to adopt reality after being hit over the head with it for three presidential terms. Still, he does at least begin to ask the right questions. He spent an entire lifetime signing off on tax increases that affected real people, real businesses, put many people out of work, and stifled economic growth. He did so on the belief that there was no negative consequences to these laws. To these ideals. This 1992 op-ed of his is if nothing else and admission that his ideals and his actions based on those ideals did indeed have negative consequences.His article also provides a bit of insight as to why the Obama administration finds economic recovery so elusive. Alas, that perspective, that overt acknowledgement of reality, that he was wrong about the socialist agenda, left McGovern instead of the older statesman, something of a pariah within the party. After all, if the Democrats were forced into admitting what McGovern did, that the ideas and ideals behind the their agenda were wrong, that they actually hurt the very people they claim to be trying to help, most of Democrat party ideas and ideals would have vanished decades ago. As it is, the Democrat Party of today would never have nominated McGovern, having gone so far to the left as to barely acknowledge his existence. Indeed, every single roadblock McGovern mentions in his piece, still exist today. As an example, take his point about healthcare costs… who wouldn’t take the premiums of 1992 over what we have after 20 more years of government attempting to control healthcare costs? Eventually McGovern would be forced to admit the reality that every time government intrudes in healthcare, ostensibly to lower costs, costs actually rise. The problem we face as legislators is: Where do we set the bar so that it is not too high to clear? I don’t have the answer. I do know that we need to start raising these questions more often. The natural progression of things, given more time, would have in the end led McGovern to the conclusion that perhaps the bar should not have been set at all, being the exact opposite of that which was written into the Constitution. The idea of Limited Government, as prescribed by the founders, was an idea that somehow gave McGovern the slip. Still, McGovern, in the end, had it all over Obama. He unlike Obama, could admit he was wrong. He just couldn’t bring himself to admit WHY.